Royal City Fine Cars have announced that they offer a range of affordable, quality used cars. The Guelph based auto expert’s inventory spans a wide selection of types, makes and models of vehicles. The dealership focuses on great customer relations and they treat every single customer with first class level of professionalism. They state that they are honoured to help their customers and even if they aren’t local, they will ship their vehicle purchase to any location world wide. 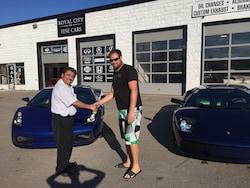 Royal City Fine Cars is a OMVIC licensed used car dealer. OMVIC is a body that administers Ontario’s Motor Vehicle Dealers Act, which protects the rights of consumers. This ensures a safe, fair and informed marketplace in Ontario.